8" true left-hand knife edge dressmaker's shears, chrome over nickel plated, packaged in gift box with molded nylon sheath. True left hand shears provide true comfort and accurate cutting for left handers. These knife edge dressmaker's shears are capable of cutting through many thick layers of fabric and the knife edge can be sharpened with the G-S sharpening stone. Bent handles are angled for smooth and easy cutting on tabletop or counter. This is an indispensable tool for sewing, quilting and craftwork. What is the difference between left and right hand Scissors? 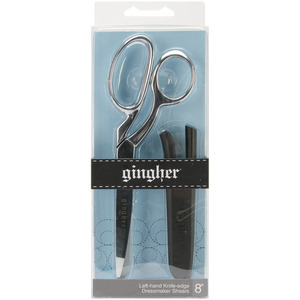 With left handed scissors, the blades are the other way round (the half that comes up when you open them is on the left), so that when cutting the blades are pushed together instead of apart like what would happen if a leftie used right-handed scissors. also, if the scissors have angled grips so your fingers are more comfortable and slide in better, those are the other way around as well (as your fingers are coming in from the other side.